Seriously, is there anything more majestic and lovely than a UNICORN? My daughter would tell you “NO”! There is nothing better than a unicorn. Lucky for her she got her second favorite thing too….. CUPCAKES! So just between those two things she had a very magical birthday. When I first heard her desired theme I automatically connected it with rainbow. I assembled my favorite version of each color of the rainbow, but it just wasn’t happening. I didn’t like the way it looked so I picked out all my favorite girly colors and that’s where is started to come together. I can find nearly everything I need for a party at Oriental Trading. 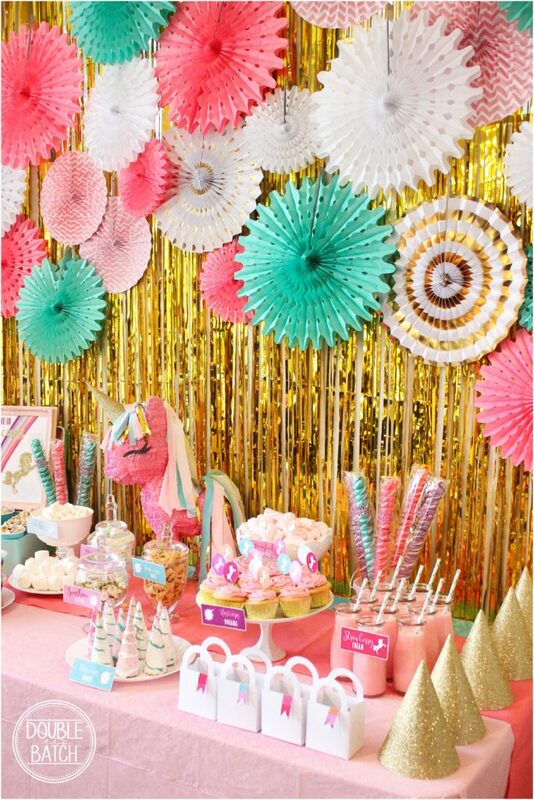 They have a huge variety of party supplies that fit every party theme! I BELIEVE IN UNICORNS! 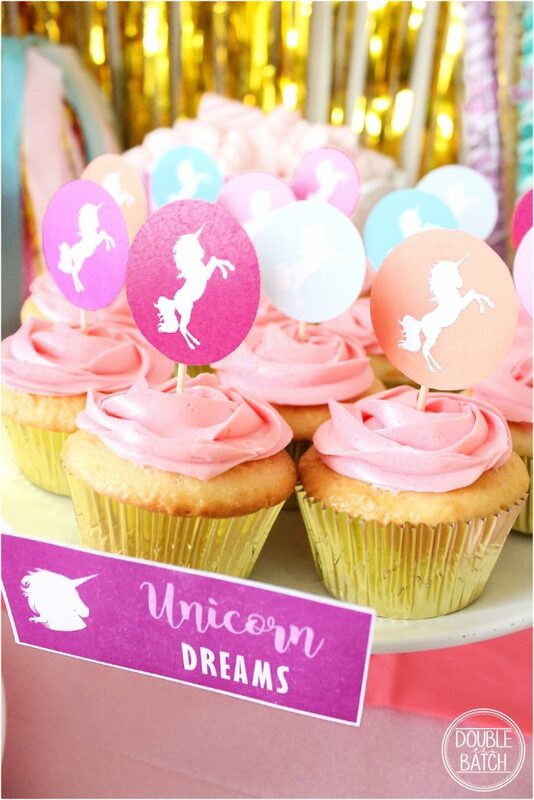 There is a free printable for the unicorn and rainbow pictures at the bottom of the post. Before I framed the picture I applied glue and then glitter to the unicorn and the word unicorn. Let it dry and then trimmed it to fit into a 8 x 10 frame. The little party favor boxes I found at the dollar store and came with a dozen boxes. I filled them with pink, blue and gold treats. Mini and Large marshmallows make perfect fluffy clouds. 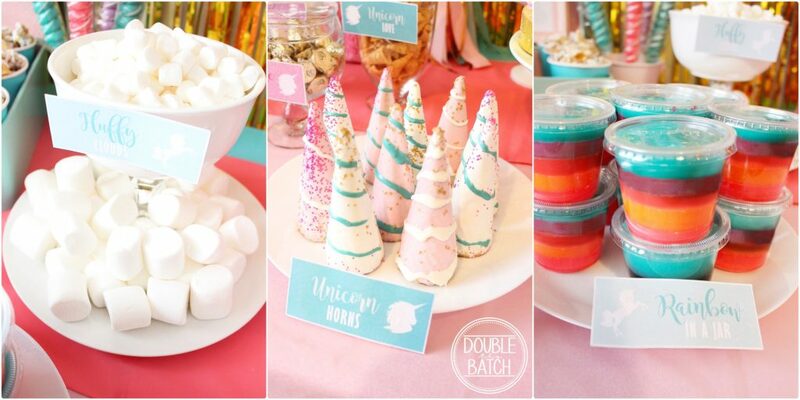 The unicorn horns are upside-down sugar cones covered in chocolate. Rainbow in a jar is made of 5 different flavors of jello to coordinate with the colors in the party. In all these small containers (I did 24 at a time) I started the bottom color and then let it set for 45 minutes. Then added the next color, let set, and so on… until I used all the colors. The Rainbow fudge was a mix of a bag of melted marshmallow folded into colored melted candy melts. Then poured into a wax paper covered pan and then added colored candies and sprinkles. Then refrigerate for at least 30 min. Magical mix is a combination of Bugle chips (they look like unicorn horns), Lucky Charms cereal, KiX cereal and colored chocolate candies. Then I drizzled white chocolate over the mix. The kids were so excited to get these giant twist lollipops. The ponytail twists were a cute and yummy addition to the party. 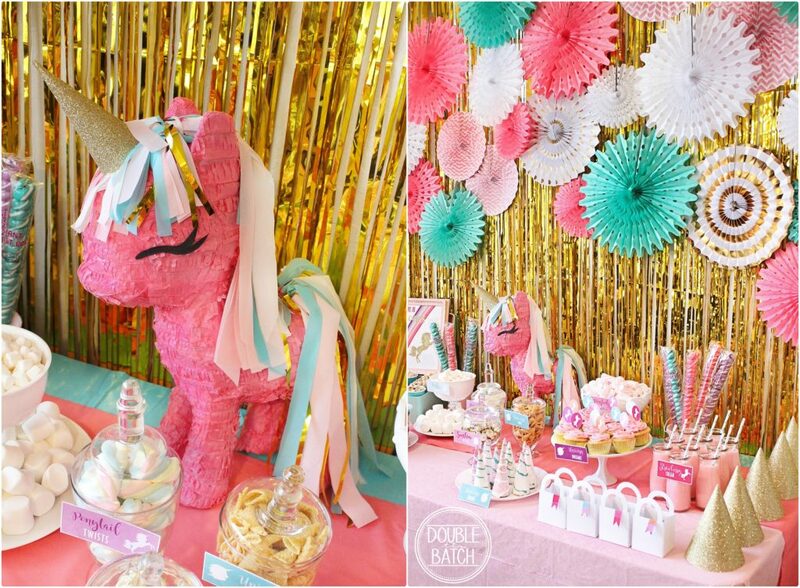 This cute pinata was originally a My Little pony Pinata that I got from Oriental trading. It was really cute but not exactly the look I was going for so I made some minor changes to the eye and hair and added a horn. I made the tail and mane with strips I cut from white, pink and turquoise plastic table cloths. I also used these colored table cothes on the table. I found the gold back drop and the hanging paper fans, glass treat jars and mini suitcase from Oriental Trading. 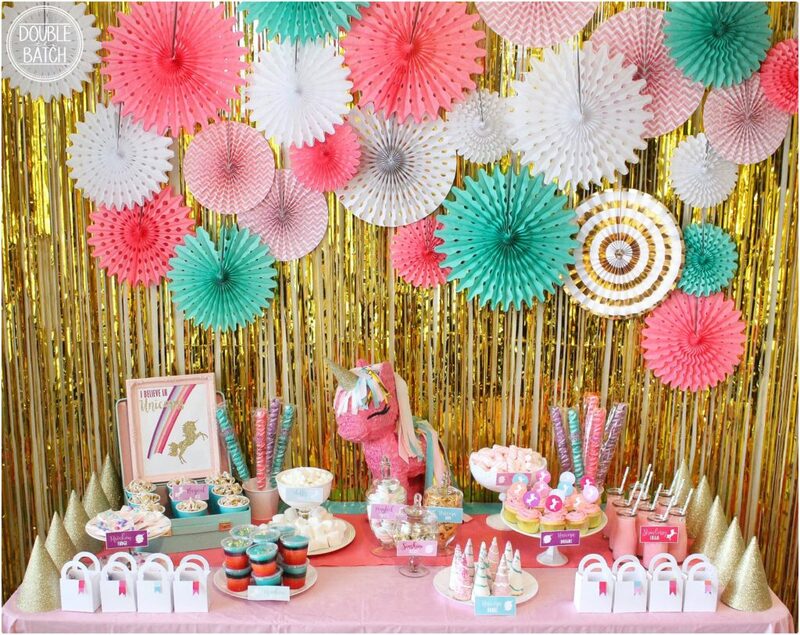 They are really nice quality and add a lot to the party decor. They seriously have anything you need for a party. I used Betty Crocker pink strawberry frosting. Print and cut out the free printable and taped a toothpick to the back of the each one. Then I gently pressed them into a frosted cupcake. Easy and Pretty! Here is another of her favorites… Strawberry Milk! These cute little milk jars can be found here! 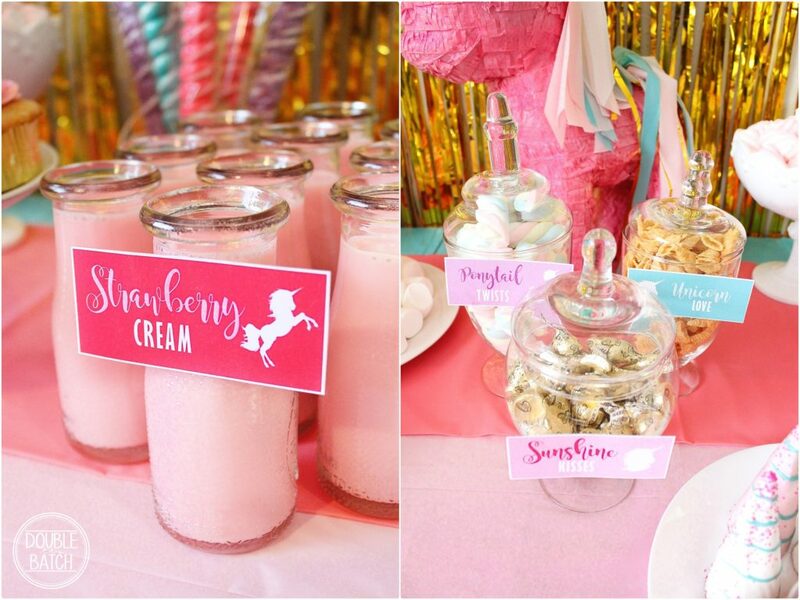 These pretty candy jars were filled with other yummy treats that the kids love. Look at this Pretty little Birthday girl! 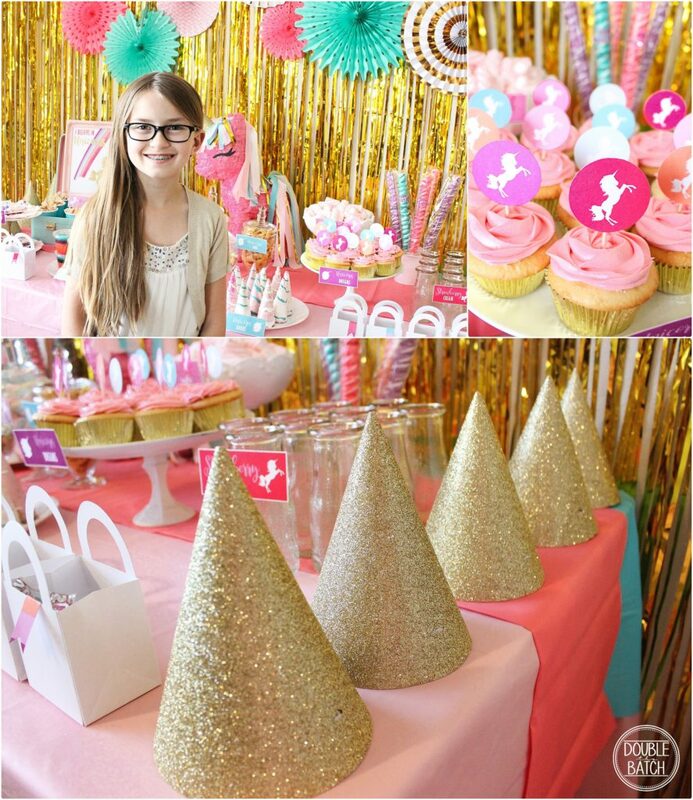 The glittery gold party hats were too cute and the kids loved them. We also did crafts with unicorns and rainbows found here. It was such a pretty and fun party! Perfect for girls of all ages! 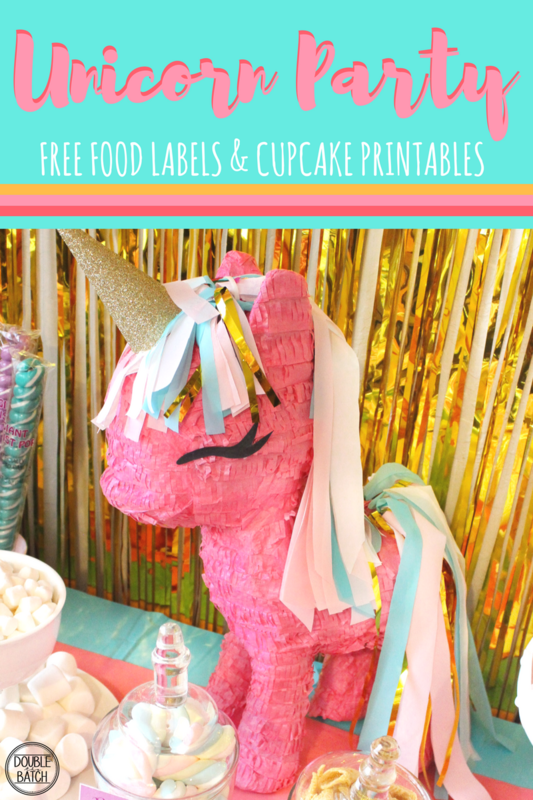 DON’T FORGET YOUR FREE PARTY PRINTABLES!